I don’t have my finger on the pulse of black America, and I don’t pretend to understand the emotional and symbolic value of a black President to the African-American community. But I do know that the big-government policies of the Obama Administration have not been good news for blacks. Here’s an excerpt from a new Associated Press story about the growing wealth gap between white and black America. The wealth gaps between whites and minorities have grown to their widest levels in a quarter-century. The recession and uneven recovery have erased decades of minority gains, leaving whites on average with 20 times the net worth of blacks and 18 times that of Hispanics, according to an analysis of new Census data. The analysis shows the racial and ethnic impact of the economic meltdown, which ravaged housing values and sent unemployment soaring. To be fair, the numbers started turning in the wrong direction under Bush, and Obama is right when he says he inherited a bad situation. On the other hand, Obama has continued the big-government and interventionist policies of his predecessor, so it’s not clear that this is much of an excuse. 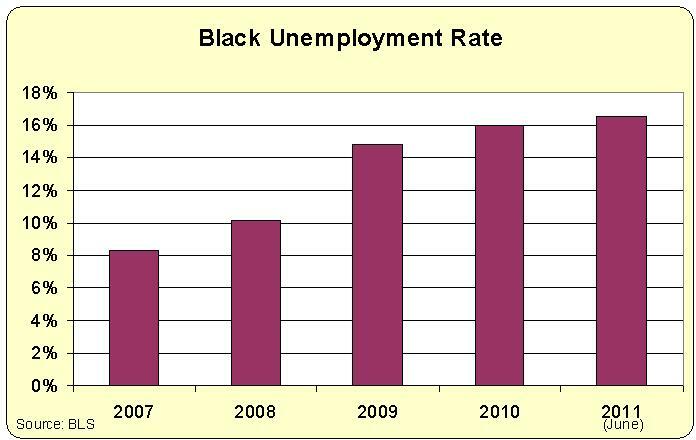 The unemployment data also shows bad news for blacks. This chart uses data from the Bureau of Labor Statistics and it shows unemployment among African-Americans has nearly doubled in recent years. Once again, it’s worth pointing out that the numbers were heading in the wrong direction as Obama took office. But as I note above, I’m not sure that matters since Obama has continued Bush’s approach of higher spending and more intervention. But even if you can’t accept that analysis because you’re a partisan Democrat or Republican, all that really matters is that the black unemployment rate has increased dramatically and is now stubbornly high. The moral of the story, needless to say, is that free markets and small government are the right policies. That’s the best approach to improve living standards for all Americans. But lower-income Americans are especially vulnerable to economic fragility, so better economic performance disproportionately helps people on the bottom rungs of the economic ladder. It’s sad that there’s only 2 good comments on this informative and level-headed post…and a random Irish language lesson. Thanks…? It’s not hard to see the differences in rhetoric and results. Bush spoke of establishing the “ownership society”, where all Americans including minorities would own homes, stock, cars, etc. Obama wants to create an entitlement society where everyone gets a government handout. The country literally can’t borrow money fast enough (debt ceiling) for the Democrats to spend, and Obamacare hasn’t even started yet. The entire Democrat vision for the country has failed decisively. People want jobs, not handouts that the government has to borrow to pay for. Corporate taxes have to be lowered so companies can afford to do business here. The government has to stop choosing winners and losers in the marketplace. Most of all, people have to be allowed to act in their own best interests instead of being told what to do by a few hundred corrupt pinheads in Congress and the White House. Once again your pointing at a downturn “under Bush” when the downturn occured after the democrats took control of Congress. Few of Bush’s policies were continuied as the democrats wrote their own bills. Yes, spending went up under Bush, as a necessary rewaction to 9/11, a war on two fronts against terrorism, and the response to two major hurricanes (Katrina and Rita). The first six years “under Bush” saw an economic boom and a related record low unemployment rate dispite those events listed above. The downturn can be directly traced to the election of 2006 and the democrats retaking control of the pursestrings. Symbolic value of ‘black president’ or ‘women president’ etc creeps up when there’s absence of any real ideals…! Yea regulations and big government only make it harder for those are already poor and ill-equipped to take advantage of resources, while those who are rich make it through in spite of hard conditions; that’s how gaps grow. on July 26, 2011 at 10:26 am Art R.
Daniel, when will you admit to yourself that unfettered free trade (a corollary of free markets) is the problem? The jobs that minorities and lower class whites once had in shoe and leather, garment, textile, toy, electronics assembly, metal fabrication, ship building, furniture, railroad passenger car and other basic manufacturing have mostly disappeared. They were outsourced by Big Kapital in order to bring more to the bottom line or American companies were put out of business by nations practicing adversarial trade through currency manipulation and/or dumping of product. Throwing money at the educational establishment (the duopoly’s solution to the problem) in order to turn those folks into semiconductor physicists, protein chemists, etc. is a dead end.